VIDEO: Wild Tiger Cubs At Play : The Two-Way The images show why the Indonesian government needs to fulfill its pledge to protect the tigers' habitat, the World Wildlife Fund says. 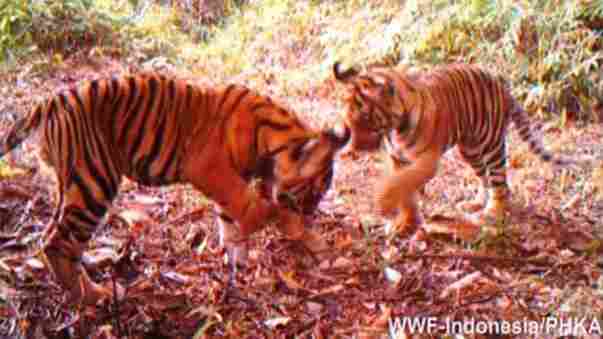 Making the case that the Indonesian government needs to fulfill its pledge to protect the rare Sumatran tigers that live within its borders, the World Wildlife Fund today released video and photos of 12 tigers that came in view of its hidden camera over the course of two months. The scenes include, WWF says, "two mothers with cubs and three young tiger siblings playfully chasing a leaf." The region is Bukit Tigapuluh. According to WWF, "around 400 Sumatran tigers are left in the wild." Pulp and paper companies are hoping to clear the region's forests, WWF warns.